We are, and continue to be, the pioneering organization for the Quality movement in the U.S.
Subir Chowdhury is the Chairman and CEO of ASI Consulting Group. He is a career quality and systems engineer. He works with all teams and provides leadership during planning and implementation. Subir’s expertise is in Design For Six Sigma (DFSS) and LEO® (Listen, Enrich, Optimize). He regularly advises CEOs and senior leadership in how to achieve bottom line results. 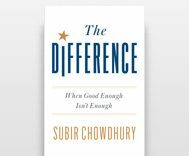 Subir has been ranked among world’s top 50 thinkers since 2011 by Thinkers50, a nonprofit global organization that issues a biennial ranking of management thinkers based on their contribution toward the advancement of business management. Outstanding American by Choice Award U.S. Government, DHS/USCIS First Michigan person ever to be distinguished with this most prestigious honor from the U.S. Government. Recipients display exceptional accomplishments through professional achievements and leadership, civic participation, responsible citizenship, and demonstrate outstanding commitment to the United States while embodying the values and ideals that are inherent to this country, and within each of its citizens. 40 under 40 honored by Crain’s Detroit Business. Golden Quill Award presented by the American Society for Quality for authorship. Whos Who in America by the Marquis Whos Who Publication Board. Whos Who in the World by the Marquis Whos Who Publication Board.